Last year I went to Bali for the first time and had an awesome and very relaxing holiday with the boyfriend. Bali truly is a magical place. But when a good friend of mine heard I was going to Bali with the new boyfriend she was flabbergasted. No she wasn’t a prude. She was just concerned because she had heard rumours that Bali brings about the kiss of death for any unmarried couple. What’s that all about you ask? Well, apparently she heard that any unmarried couple who visits Bali will break up after a trip there. I wasn’t the suspicious sort and went ahead with the holiday. But after I came back I was curious about this so-called curse so I did a little research about it. Apparently there’s a story to the curse but since this post is not about the curse, I’ll leave you to read more about it in this concise post. So while in Bali, I took a lot of photographs with my iPhone and realised there a story to be found within the photographs. It’s time for a comic, or two. 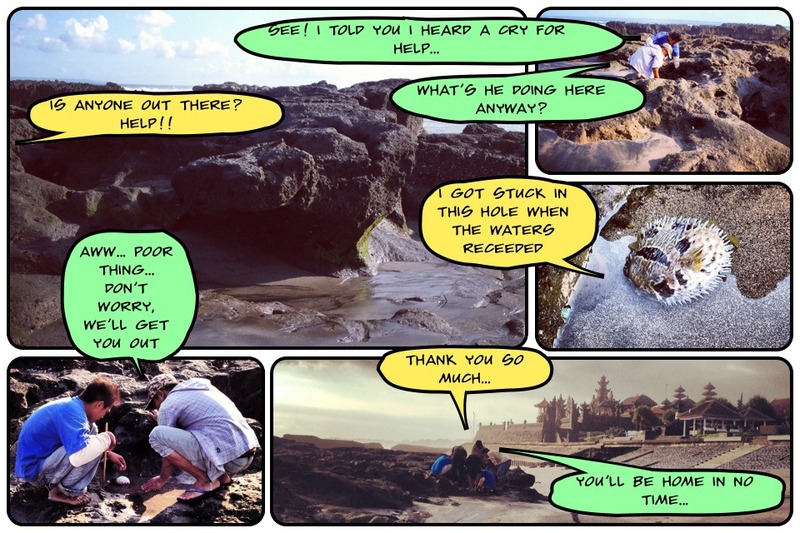 It’s a tale of a little puffer fish who got stranded in one of the waterholes along the beach. You’ll notice two comics in this post. If you’re a optimist, I suggest you read the first comic strip. If you’re the glass is half empty kind of person, I suggest you go right ahead and read the second one. Why are there two outcomes? Well, the boyfriend read the original comic I made and felt it was too depressing. 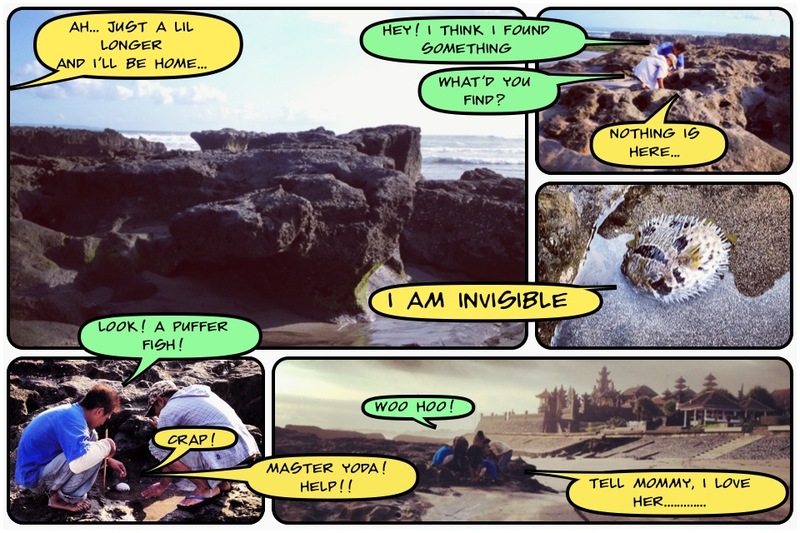 So for his reading pleasure I made a more positive comic using the same photographs. I do hope the puffer fish was released back into the ocean, but I highly doubt that was the case. If you want to find out more about my Bali trip, you can read all about it here.